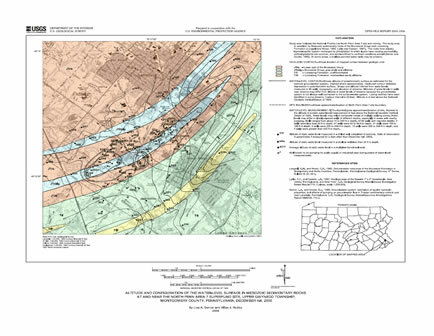 2000 to 2001-USGS, Malvern, PA: Member of Pennsylvania Bridge Scour Assessment team; completed groundwater map of North Penn Area 7 Superfund site. 2001 to 2003- USGS, Dover, DE: Operated 13 stream gages, oversaw field component of salt-water intrusion monitoring for a coastal county, assisted with contaminate hydrogeology studies at a military facility, took lead role in data collection for nutrient-load study to a coastal bay. Senior, Lisa A.; Ruddy, Allan J. Senior, L.A., Ruddy A.J., 2004, Altitude and Configuration of the Water-Level Surface in Mesozoic Sedimentary Rocks at and Near the North Penn Area 7 Superfund Site, Upper Gwynedd Township, Montgomery County, Pennsylvania, December 4-6, 2000: U.S. Geological Survey Open-File Report 2004–1006, 1 sheet, 1:24,000. https://pubs.er.usgs.gov/publication/ofr041006.